There are "other" shop hazards that can plague model makers - learn what they are and how to avoid them. Model makers are good at avoiding repetitive task injuries and over-exertion in their daily routine, but repetitive or sustained awkward postures may not be as easy to recognize when concentrating over a programming task or finishing a part. There are three major workplace injury risk factors, all resulting in musculoskeletal disorders (MSD). These are high task repetition, forceful exertions, and repetitive or sustained awkward postures. Model makers are generally aware of, and good at avoiding, the first two but may not easily recognize the last one when they are concentrating over a programming task or finishing a part. Yale University’s Environmental Health & Safety program offers some insight into recognizing, avoiding or correcting simple ergonomic issues. Some examples of awkward postures involve twisting, bending, reaching, pulling or lifting. Other examples are working with hands above the head, elbows above shoulders, and working with neck or back bent more than 30 degrees without support or the ability to vary posture. Be aware of your posture. Good posture maintains the natural curve of your spine, relaxed shoulders that are held slightly back and level, ears in line with shoulders, chin ucked slightly inward and pelvis shifted forward to allow the hips to align with the ankles. 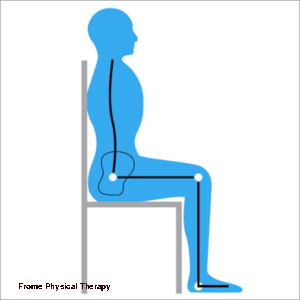 Good seated posture means distributing your body weight evenly on both hips, keeping your back’s natural curves (a good way to do this is to slouch completely, then draw yourself up and accentuate the curve of your back as far as possible, hold for a few seconds, then release the position slightly – about 10 degrees), while keeping feet flat on the floor. Maintain neutral wrist/arm postures as much as possible. Rest your elbows and arms on your chair or desk while keeping shoulders relaxed. If your shoulders are hunched or pushed towards the ears, drop your arms for a counter-stretch and adjust the height of your chair. Avoid sharp twisting and bending motions. These types of movements can put pressure on the spine’s discs. Finally, respecting your discomfort or pain means listening to your body’s cues and changing positions and stretching to ease stiff muscles. Even taking a short break can halt the injury before it begins. Sometimes, we feel the pain but work through it to the detriment of our well-being. Standing or sitting for extended periods of time can cause back, neck and leg pain and maintaining an awkward posture can stress the spine or cause muscle fatigue and pain. Taking a short walk around the shop, allowing yourself to stretch, especially in a counteractive manner, or taking a quick mental break will add mere minutes to your timeline, but will keep you in better shape for the duration of the project. 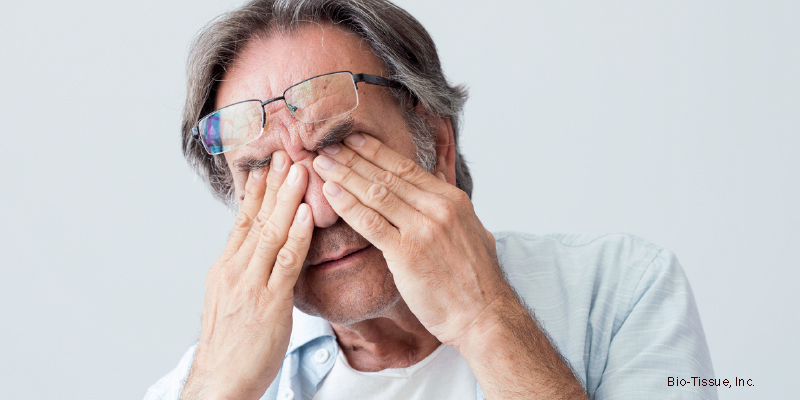 Eye strain is also a major contributor to feeling fatigue or more serious suffering down the line. Aside from the mechanical factors like proper lighting, minimizing glare, or adjusting your monitor’s brightness or contrast, there are two very easy routines to incorporate that will minimize strain to your eyes. Blink more - Prolonged staring, like at a computer screen, reduces blinking and dries your eyes out. Blinking, as simple as it sounds, can really help by moistening eyes and reducing irritation. Just blink your eyes very slowly (as if falling asleep) about 10 times for a few times each hour. This will rewet your eyes naturally and keep them feeling refreshed. Look away - Eye strain can also be caused by remaining focused on your screen for prolonged periods of time. Looking away, at an object at least 20 feet away for about 20 seconds every 20 minutes or so relaxes the eye muscles. Taking breaks away from your work might seem counterproductive when there is a looming deadline, but studies show that breaks actually have the opposite effect. According to a study by the National Institute for Occupational Safety and Health (NIOSH), short rest breaks throughout the day “may relieve cumulative discomforts from repetitive motions and static postures in a way that conventional break schedules do not.” The study calls for four 5-minute breaks spaced throughout the workday. Not only were physical symptoms of stress and fatigue avoided, but general cheerfulness and energy were improved.